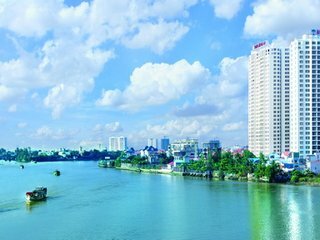 Finding a house or an apartment to rent or to buy in Saigon is probably one of the most crucial factors in making your transition to Vietnam a success story. Ho Chi Minh City has a plethora of options available to suit all budgets from low-cost studio apartments to international-standard luxury homes. Where you decide to nest in HCMC will depend on several factors: what type of accommodation you prefer to live in and can afford, what part of town (think: district) you want to live in, and what amenities come with your future home. It is a renter’s market in Ho Chi Minh City, plain and simple. Before 2008, there was a lack of mid-range rental accommodation. Up until then, landlords could pick and choose who they rented to. There are resident horror stories about being evicted to make way for others willing to pay an extra million dong and with tales of increased rental prices mid-contract. Fast forward to today’s market where rents are about half of what they were in 2008. With the collapse of the real estate sector as well as a glut of mid-range to upscale options (US$600 to US$1,500 per month), it is no wonder incoming residents to the city have a wide choice. So you could ride the renter bonhomie as long as that lasts. Or you can reduce your risk, anchor down and buy a home. According to Vietnamese law, overseas Vietnamese and foreigners can possess a single house ownership certificate and the house described in the document. Additionally, foreigners can purchase non-landed (apartments, condominiums) property ownership for 50 years. A foreigner with this certification is only allowed to live in the property but not to lease the property to others. Once the ownership certificate has expired, the foreign homeowner can extend the lease for another 50 years. It is also possible to own a group of non-landed properties as a foreigner, but there are restrictions to the number of units in a neighbourhood that can be foreign-owned: 30 percent of units in a single condominium, and only up to 250 houses per administrative ward. It’s permitted, but generally buying property has not really taken off with the expatriate community in Saigon. According to a statistic from the General Department of Land Management, less than a 1000 properties are sold every year to foreign investors. Foreign ownership has stagnated in other areas as well. While foreigners have been able to buy property since 2008, the policies allowing foreigners to own land have been restrictive. If you are looking for buying or renting, we present you here the best apartments and house complexes for expatriates, along with a selection of real estate agents and relocation services. Also check out our top 10 list of real estate websites.